Aiming to maximize the science being done at sea, Falkor will embark on its first transruise or “Research on Transit” this December, as she sails from Guam to Honolulu, Hawaii. Dr. John Smith and his team will join Falkor crew as they stop in the Pacific Remote Islands Marine National Monument 1,830 nautical miles (3,390 kilometers) southwest of Honolulu. In this remote protected area lies Johnston Atoll, the closest landmass to Hawaii, some 717 nautical miles (1,328 km) from Honolulu. In 2014, the Johnston Atoll Unit was expanded from 50 to 200 nautical miles, and while there have been several cruises dedicated to mapping parts of Johnston Atoll, a vast amount is unmapped, unexplored, and unknown. A large number of seamounts, ridges and other features at Johnston are saturated with unique organisms such as high-density deep-sea coral and sponge communities, as well a high concentration of deep-sea minerals. Many researchers consider Johnston Atoll a key marker in biological boundaries – a mapping waypoint for many species. It marks the southernmost range for species common in Hawaii, and is considered a stepping stone for many central and south Pacific marine species expanding their populations to the Northwestern Hawaiian Islands (also known as the Papahanaumokuakea Marine National Monument). This remote area is ripe for mapping to better inform future ROV cruises to collect data and expand knowledge for scientific research and new discoveries. The team plans to map over 7000 km² over four days along a portion of the unmapped Johnston Seamount group, where at least three unexplored seamounts will be investigated. 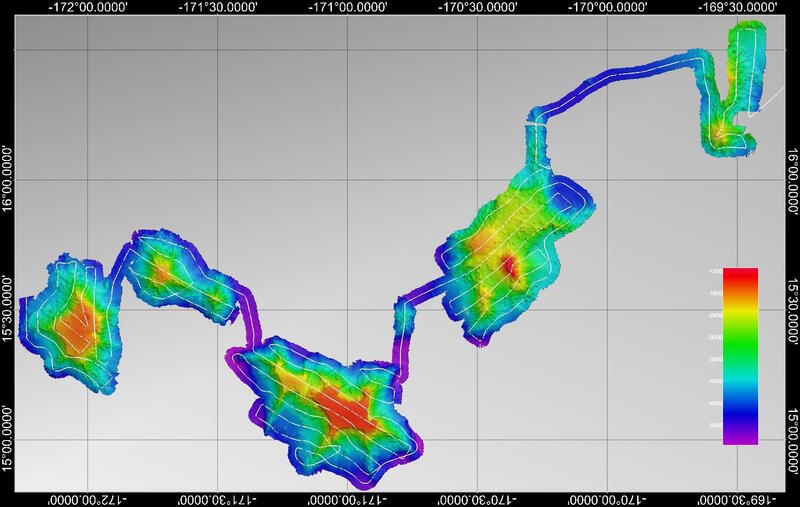 Scientists will perform multibeam mapping as well as sub-bottom and magnetics surveys. Falkor’s multibeam systems will be used, as well as a Compressed High Intensity Radar Pulse sub-bottom profiler (CHIRP). CHIRP uses sound frequency within the radar ‘ping’ as it moves over a range, instead of a single frequency, bringing better resolution compared to fixed-frequency sonars. Falkor will also tow a magnetometer to collect magnetics surveys along the sub-seafloor. With data from these sensors and tools onboard, the team will be using Falkor’s supercomputing resources to combine this newly-discovered information with existing data and maps. The results will be provided to the research community and public. The NOAA Ship Okeanos Explorer has two expeditions planned for 2017, and these opportunities can be maximized with the maps and information gathered during our research cruise prior, with data sharing resulting in more productive dives. Unique to this mission, the science team will include two participants from Schmidt Ocean Institute’s sister organization, 11th Hour Racing. A father son team, Brock Callen Sr., 11th Hour sponsorship partner, and Brock Callen Jr. an 11th Hour Racing Ambassador, will learn first-hand about research as sea, applying their maritime sciences, sailing and sports background experience. Encapsulating connections in conservation and ocean health, the “Brocks” will bring different ends of the maritime spectrum together through ship-to-shore connections with classrooms and athletes alike. 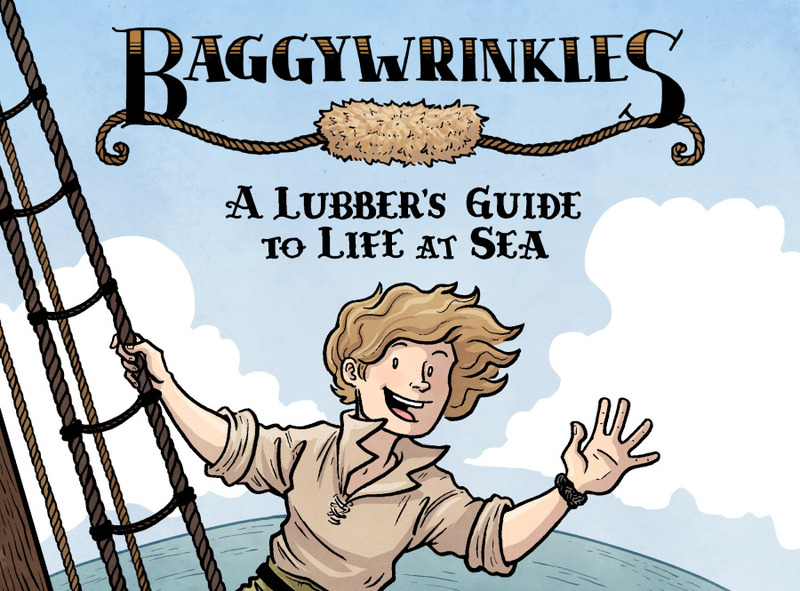 Accompanying them will be Artist-at-Sea participant Lucy Bellwood, author of the educational graphic novel Baggywrinkles: a Lubber’s Guide to Life at Sea, will help bring the mission to life through her illustration and comics work. Educator Jena Kline will also be on board, writing lesson plans for high school classrooms based on the research completed at sea, along with Student Opportunities applicant and University of Guam graduate student Andrew Kang. 30-day Preliminary Cruise Report, Measurements Taken, and Trackline of Mapping Completed. Data Quality Remarks: The Kongsberg EM302 data quality was flagged green, with the exception of the acrosstrack beam noise, which was flagged yellow. 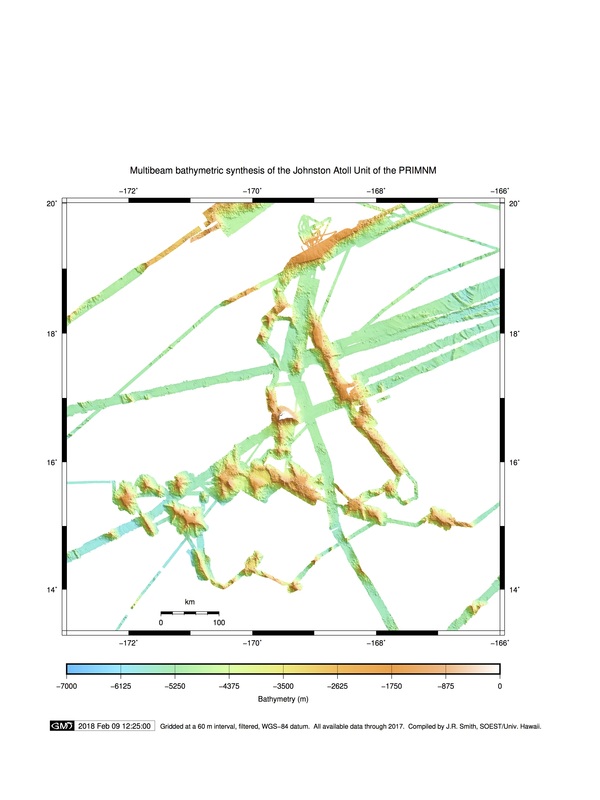 Bathymetry and Sidescan data, including swath files, are publicly available through Marine Geoscience Data System. 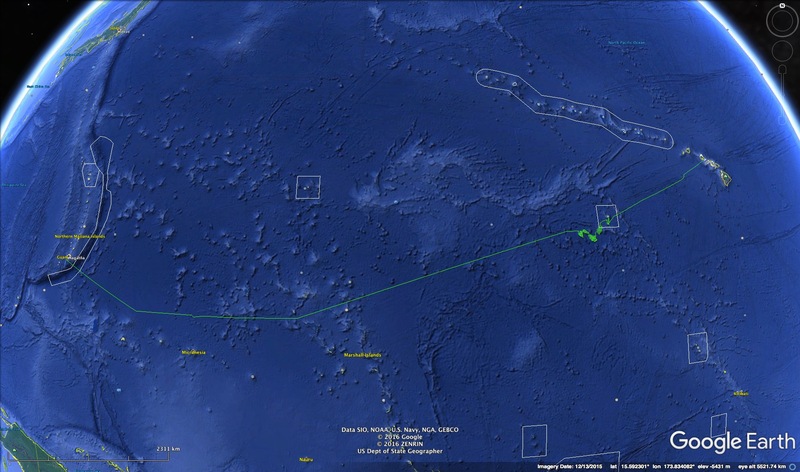 Multibeam synthesis map of the Johnston Atoll Monument Unit, including data collected by Falkor and Okeanos Explorer.